The DC portion of the campus includes more than 60,000 square feet of storage space. NEWNAN, Geo. 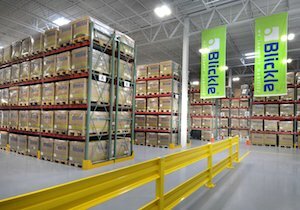 – Blickle U.S.A. has taken occupancy of a new 62,491 square foot multi-million-dollar facility located in Newnan, Georgia. The building, designed and built specifically for Blickle, completes Phase One of the company’s U.S. headquarter campus. The 19.5-acre (7.9-ha) site has been developed and prepped with utilities in place for future expansion. Provisions for a railway spur to service the facility have also been made. All U.S. operations will be managed from the facility including engineering, custom manufacturing, sales, customer service, product testing, customer and distributor training, as well as shipping. 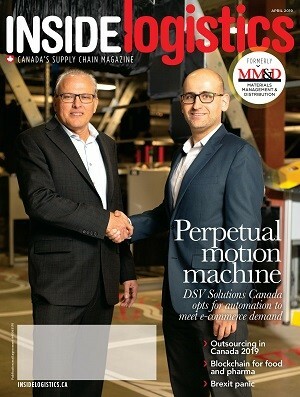 The facility includes a customer experience centre where staff, customers, and OEMs can perform comparisons of multiple casters and wheels on their devices under a variety of real world conditions including different surfaces, inclines and declines, under load or empty, and in wet or dry environments. A proprietary test device can even demonstrate the effects of wear and tear over time by subjecting wheels to a high volume of cycles under a variety of conditions in a very short amount of time. There’s even an outdoor test track. “Our applications experts can tell someone with a very high degree of certainty what the best caster is for their needs. But, showing them in a realistic test environment gives them the 100 per cent certainty to make their selection with complete confidence,” said Blickle U.S.A. president Scott Chahalis. The centre is equipped with an array of IP cameras so tests can be monitored remotely in real-time via Blickle’s secure web portal. More than 62,000-square-feet of the building is dedicated to maintaining a vast inventory of wheel sizes and caster configurations. Blickle Räder+Rollen GmbH is a third-generation family company established in 1953. With more than 30,000 items in its standard product range, it is one of the world’s leading manufacturers of wheels and casters. The group has over 1,000 employees; more than 750 of these based at the Headquarters in Rosenfeld, Germany. In addition to the production facilities in Rosenfeld, Blickle has 17 sales subsidiaries in Europe, North America and Asia, and supplies products to over 120 countries worldwide. The Blickle Group generated sales of more than $255 million in 2018.